I’ve been thinking about death quite a bit while I’ve been here. More specifically, I’ve been afraid of death. It’s easy to say you’ll have the attitude of, “what a better place to die than in Hajj”—I know I used to think that way. But almost every day has been a reminder of death. There was the crane accident that happened in Mecca when we first arrived, killing about 80 people, and just 2 days ago there was a major accident at the Jamarat—the cause of which is only hearsay at this point—which ended up with reportedly 700 people dead. 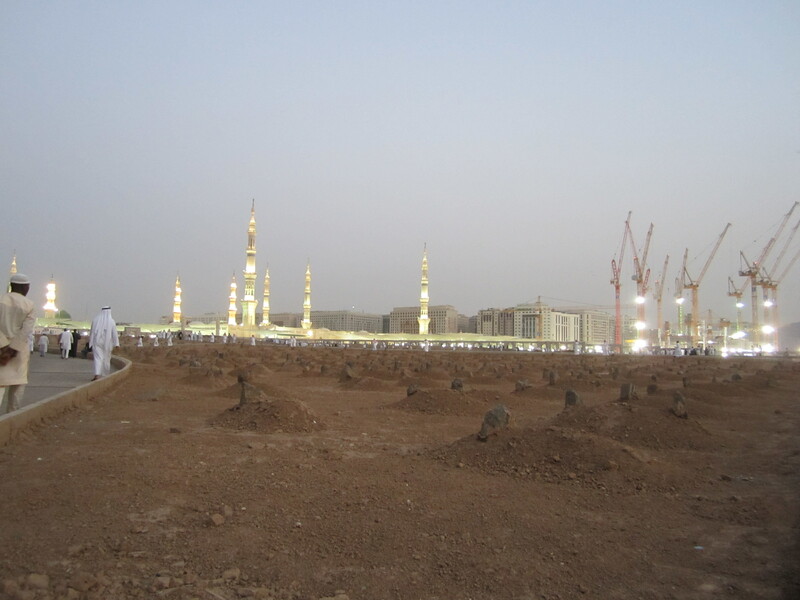 Then after nearly every prayer in Mecca and Medina, there has been a janaza (funeral) prayer for someone who has died. I’ve become afraid of dying in these last few days. But it’s not a fear of death itself or what comes after; looking back on my life, I don’t think it’s ever been about that. My fear, I feel, is more about what I’m leaving behind. About being so far away from home. I know my death is already written, and every step we take is another step closer to our grave. And I know it’s easy to say that this life is temporary, that Paradise is our real home, and I get that. Back home, in Edmonton, I felt comfortable with death. I felt I’d squared away my worries of death and come to terms with it. But out here I feel like I’m constantly in close proximity of death. I’m reminded of the ayah of the Qur’an: “No soul knows in what land it shall die. God is All-knowing, All-aware.” (31:34). And I keep thinking about home. The only comfort I’ve found is in my duas. I always say the recommended duas: “so long as life is good for me, let me live, and when death becomes better for me, let me die.”; “O Allah, do not take me out of this life until you are completely pleased with me.”; and recently, “make my life an increase in every good, and death a relief from every evil.” I don’t think there’s much else I can mention here; I just needed to get it of my chest. I wrote up a will prior to leaving for Hajj. It was actually recommended by Sheikh Tamir and almost every “How-to-Hajj” guide that I came across. The reason being isn’t that you’re expected to die; it’s that you never know. I also recorded a farewell video, wherein I said my last goodbyes to everyone I knew, which helped bring about some closure to my life should I depart it unexpectedly. The year I went for Hajj was the most deadly Hajj season in recent history. The crane incident and the Mina Stampede resulted in the deaths of over 2000 people. I tried to steel myself against the thought of death. I thought I would be better prepared for it. But, if I’m being totally honest with myself, I fell short. I know that fear of death is frowned upon in Islam. Our time on earth is limited, and we’re all going to face it one way or another. Prior to leaving you tell yourself you’re not afraid to die, and that you’ll die in Hajj and that you’ll have all of the pilgrims pray over you for your funeral prayer—you make it sound so delightful you almost wish it would happen. When you’re safe at home, it’s easy for you to say you’re not afraid to die—especially on Hajj. But for myself, anyway, when I was actually there in Mecca, there would be times when I began to worry about dying. I thought about family, about friends, about my fiancé, about everything I would be leaving behind. It was more of a sorrowful fear, that sadness that comes with the thought of what is left behind. The constant reminder of death is also a reminder of how to live. Ali, the fourth Caliph of Islam and the cousin of the Prophet, is reported to have said, “Live amongst people in such a manner that if you die they weep over you and if you are alive they crave for your company.” None of us have any control over the moment of our death, the moment when the angel takes our soul. What we can control, in our own capacity, is how we choose to live. How we treat others, what we do with our time. These days, before I leave home, I try and ask myself that if I were to die today, did I leave things in a good place? I felt similarly. My daughter was my reason for wanting to live on. Yes, I still wanted to face life’s challenges and opportunities as a hopefully better person…but it was the thought of leaving her behind fatherless that got to me most. But I actually do wish for death on Hajj – a later Hajj insha – Allah – when I’m old and my kids can take care of their own lives. At least that’s what I think now. The reality might turn out to be completely different. Your closing commentary is beautiful here. JazakAllah khair.